You may be familiar with the practice of lectio divina—a contemplative reading of scripture. This prayer practice of visual lectio divina is an adaptation of the group method in which there are traditionally three readings of a given scripture, with a different meditative focus for each. This visual lectio divina can be practiced individually or with a group. Sit in silence for a few moments, opening your heart and mind to God’s presence with you. Read through the scripture passage out loud. Listen for the words or phrases that grab your attention. Write down the most compelling words and phrases from the passage. Read through the scripture passage silently. This time consider what colors come to mind as you read. There may be colors associated with actual objects in the passage—green trees, red fire, blue water—or the colors you think of may simply reflect a general mood of the scripture. Write down the colors that come to mind. Your final reading of the scripture can be silent or out loud. This time, think about the shapes that the passage invokes. These might be shapes of specific objects, but not necessarily. Write down the shape or shapes suggested by the scripture. Once you have done the contemplative reading portion of the practice, it is time to prayerfully create your artistic piece. There are many ways to develop a piece that incorporates the words, colors, and shapes from the passage. Paint, draw, write, cut, glue, stamp . . . create with the supplies you have in a way that if fun for you. After that dried I wrote the four words I had chosen multiple times randomly around the paper: amazed, astonished, bewildered, perplexed. 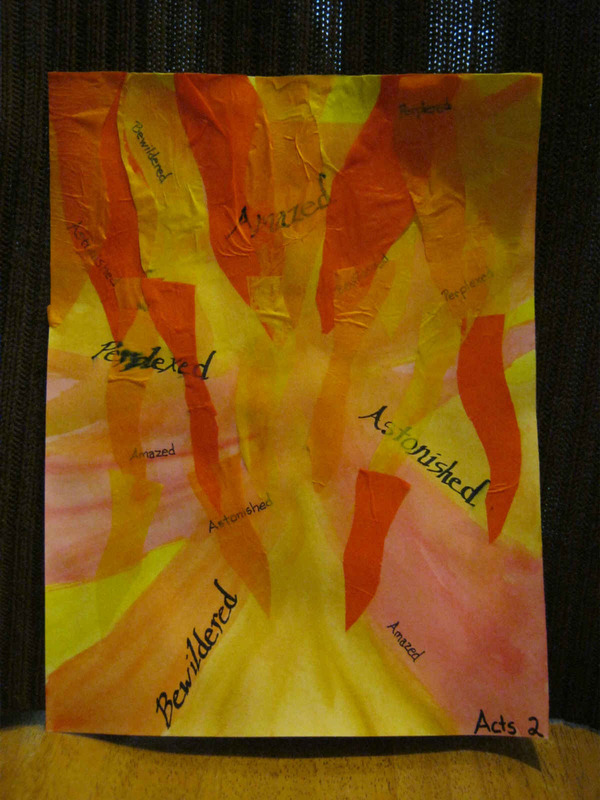 Then I cut several flame shapes out of red, yellow, and orange tissue paper and glued them onto my painting. I like that you can read the words through the tissue paper. Blessings to you as you practice prayer this week. What a great idea! I think that I’ll do this on Pentecost too – even though we’ve already celebrated it! Let me know how it goes! Hard to resist the tongues of fire.